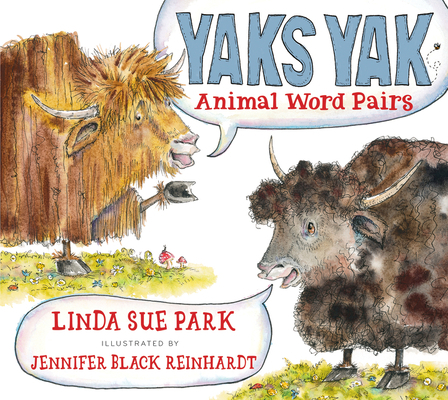 At once funny and informative, Yaks Yak presents animals acting out the verbs made from their names. Illustrations rich in comic details show hogs hogging, slugs slugging, and other spirited creatures demonstrating homographs, words with different meanings that are spelled and pronounced the same. A chart listing the words, their meanings, and their history is included. Ideal for sharing, this book offers a sprightly and fanciful introduction to a fun form of wordplay. Jennifer Black Reinhardt has illustrated many acclaimed picture books and chapter books—including Yaks Yak and Gondra's Treasure by Linda Sue Park and Sometimes You Fly by Katherine Applegate. She has also written and illustrated several, including Playing Possum. Jennifer lives with her family in Iowa City, Iowa. Visit her online at jbreinhardt.com, on Twitter @jblackreinhardt, and on Instagram @JenniferBlackReinhardt. "Details such as hats and teacups carry through from picture to picture, and on each spread the animal’s behavior and interaction with other animals of its kind are spot-on...Children will recognize the behaviors from their fellow humans while learning new vocabulary in a memorable way." * "Gleeful linguistic fun that kids will wolf down." * "Animal and word lovers alike will enjoy this clever take on homographs..."
"Young readers will love this hilarious, informative book."